Bear’s Paw Country Club in Naples, Florida, hosted Jack Nicklaus and his design team last Friday. It was the first time the global golf icon and world’s leading golf course designer had been to Bear’s Paw since the club’s 25th Anniversary celebration in 2000. 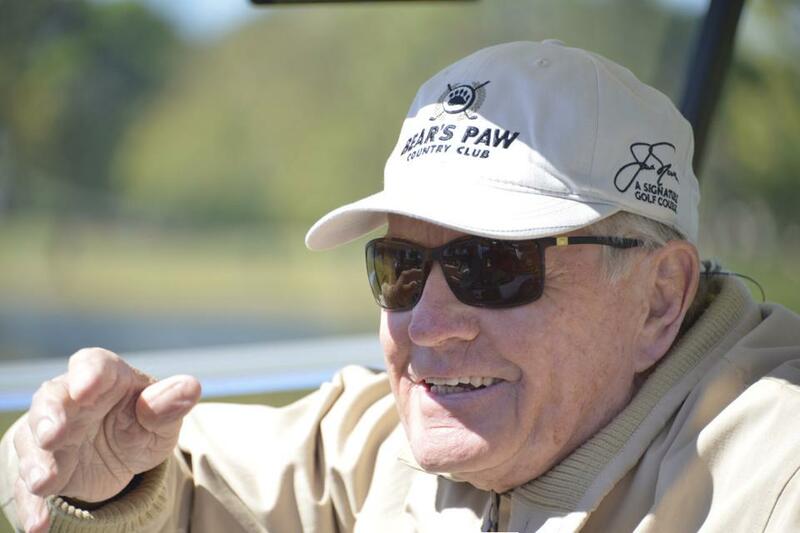 Bear’s Paw was the first Jack Nicklaus Signature Golf Course in Southwest Florida. Last year, the club’s membership voted overwhelmingly to have Nicklaus Design restore the Signature Course, using the Golden Bear’s original drawings. The restoration will include a re-grassing of fairways and roughs; rebuilding all 18 greens; the installation of a state-of-the-art irrigation system to maintain turf more efficiently; concrete cart paths; and new comfort stations throughout the course. The golf course will close April 7, 2015, to begin work and is scheduled to reopen the first of November in time to celebrate the club’s 35th Anniversary. Nicklaus is recognized globally as the greatest champion in the game’s history with a record 18 major championships. He’s also built a parallel career in golf course design, as Nicklaus Design has created more than 385 golf courses in 39 countries and 39 states. Nicklaus, who is scheduled to receive next month the Congressional Gold Medal—the highest honor the U.S. Congress can bestow on a civilian—arrived Friday afternoon courtesy of Donald Trump’s helicopter (he was at Trump National Doral, Miami, for a ribbon-cutting on the resort’s Jack Nicklaus Villa), and he worked until dark on the course to review the layout, talk to Restoration Committee members, and exchange ideas with the Bear’s Paw management team. For more information, contact Doug Brown, General Manager/COO at 239-963-3161.